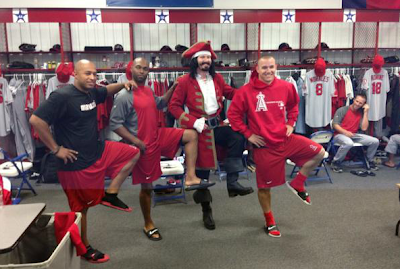 Sure, Mike Trout has only been the legal drinking age since August 7 but he's got the Captain Morgan pose down already. During some locker room shenanigans, this picture was taken with Vernon Wells, Torii Hunter and the rookie phenom hanging out with the famous rum captain. In the tweet featuring the picture, Trout didn't give a reason for the visit from the booze icon. I just assume Captain Morgan and the Dos Equis Most Interesting Man in the World had a bet to see who could get their picture taken with Mike Trout first. 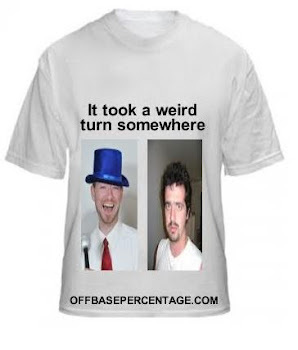 Alcoholism would help explain a lot of the Tony Reagins general manager experiment in Anaheim.